Create and manage categories in News in brief. Removing a category will not remove content. Create and manage announcements in News in brief. Try to limit the announcements to keep them useful. News blog about the Museum's research, and commentary from our scientists on stories from around the world. The evolutionary rates of sea urchins are more complex than previously thought, a finding that could apply across the evolutionary tree. Evolution within groups of organisms was first thought to occur continuously, at a constant rate. Fossil-based analyses soon led to the belief that many groups quickly reach maximum diversity early on in their history, followed by a decline in evolutionary rates as habitat types fill up. Now, in a detailed analysis of a group of marine invertebrates called echinoids, Dr Melanie Hopkins of the American Museum of Natural History and Museum palaeobiologist Dr Andrew Smith have found a branch of the evolutionary tree that has increased its evolutionary rate over time. Modern echinoids originated 265 million years ago, just before the Permian-Triassic mass extinction, an event that wiped out around 96% of all marine species. They still exist today as sea urchins and sand dollars. This slow start is very different from the standard model of high initial rates of diversification followed by a slowing down as ecological space gets filled that we have come to expect. When they looked in more detail at sub-groups of echinoids through time, they discovered that some that underwent episodes of 'early bursts' in evolution, primarily associated with the adoption of new feeding strategies. For example, one particular group of echinoids - the sand dollars - evolved a novel method of 'deposit-feeding' that allowed them to filter nutrients from the sand, and this innovation coincided with a marked increase in morphological innovation. 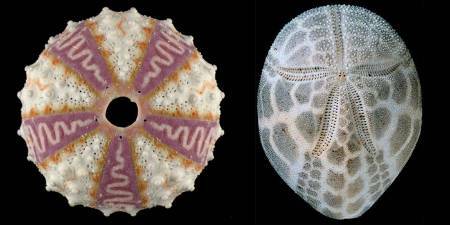 Regular echinoids like the sea urchin (left) have five-fold symmetry and can head in any direction, whereas irregular echinoids, like the sand dollar (right) have two-fold symmetry, with defined 'front' and 'back' ends. Rates of evolution turn out to be quite different when viewed at different scales, and both 'continuous' and 'early burst' patterns of evolution may apply to the same group depending upon how you view them. A species of bryozoan transplanted to an area with increased ocean acidity has been found to grow at half the rate of those living in normal ocean conditions. Bryozoans are coral-like animals that live in colonies and build their skeletons out of calcium carbonate. An international team including Museum researcher Dr Paul Taylor transplanted several budding colonies from their normal homes in the Mediterranean to an area near an active volcanic vent in Italy. Entire ecosystems are threatened by ocean acidification, and this will have economic consequences because animals such as bryozoans are often habitats for the juveniles of commercially exploited fishes and crustaceans or may be in their food chains. The bryozoan Calpensia nobilis showing normal growth at the leading edge © Lombardi et al, 2015. During a three-month experiment, the bryozoan colonies around the vent suffered slower growth rates, the absence of some growth stages, and the corrosion of their skeletons. However, individual zooids – the tiny creatures that build the colony – were longer than normal. Dr Taylor thinks this could be an indication of adaptation by the bryozoans to the changing environmental conditions. The colonies seemed to invest more energy in completing zooids that had already started to form rather than budding new generations. In other words, they were strengthening the existing colony rather than expanding. With this information, better predictions could be made of organism survival and evolution, and thus ecosystem changes, loss or survival in a changing world. The research is published today in the journal Royal Society Open Science. 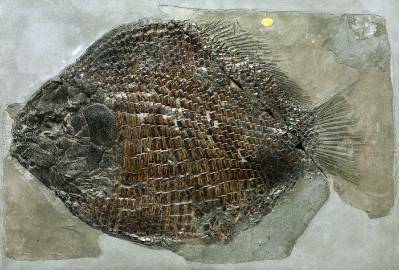 An innovative jaw bone study has revealed that a Jurassic fish ate like modern sea breams. My work indicates that Dapedium was well adapted to crush shells, feeding on bivalves and other hard-shelled creatures that it could scrape from the sea floor. A Dapedium specimen from our collections. The good preservation of the fossil fish specimens allowed Fiann to use a mechanical model developed to understand modern fishes in his study. By calculating the positions and orientations of the jaw muscles, he was able to determine that Dapedium's jaws moved slowly but strongly, allowing it to work on the hard shells of its prey. In contrast, other families of fish can have faster but weaker jaws, adapted for feeding on fish prey that are speedier and slipperier. Dapedium lived 200 million years ago during the Jurassic period, and is one of many ancient sea creatures discovered by Mary Anning in the rocks around Lyme Regis, Dorset. Dapedium is an iconic fossil from Lyme Regis and can be found on many postcards and souvenirs from Lyme Regis. If you are lucky you may even find one when fossil hunting in Lyme Regis. This study would not have been possible without the extensive fossil collections we house, which show a variety of characteristics that Fiann used for his study. His work helps us build up a picture of how Dapedium lived and what it ate. The study appears in the prestigious journal Palaeontology - a rare achievement for an undergraduate. The team work with curatorial and research staff around the Museum to bring you stories and comment on the natural world.